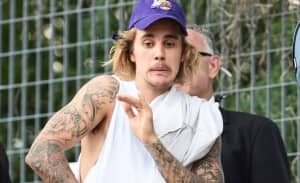 The Purpose tour has had two major hair moments this month. At a tour stop on his Purpose tour earlier this week, Justin Bieber faced an important dilemma—finish performing "What Do You Mean?" with his hair all over his face, or stop performing altogether to tie up his hair? Thanks to the hoard of screaming fans in front of him, he didn't have to do either of those things. Bieber reached into the crowd mid-song, snatched a hair tie, made a quick man bun, and finished the song. This isn't this first time a fan has recently helped Bieber with his hair. Earlier this month, an audience member came up on stage and tied Bieber's hair back for him. Watch the video of that below and read about how Bieber got help and a new sound from his friend Poo Bear.